Look back at any fitness-related resolutions you made at the beginning of this year. Did any of them involve spending 20 minutes a day skipping around like a horse, or getting covered in mud on an obstacle course? Probably not — but they just might in 2014 and beyond, if some of this year's fitness trends really take hold. Every year sees a new diet or workout that's pushed as the next big thing, but most of them fizzle out as quickly as they appeared, generally because they were onerous, unhealthy, or simply ineffective. We've combed through those trends to select the 11 strangest fitness crazes of 2013. Time will tell if they stick around, but some of them actually seem fun, and a few look effective — maybe too effective, because they also look impossible. 1. Prancercise: What else could this list start with? 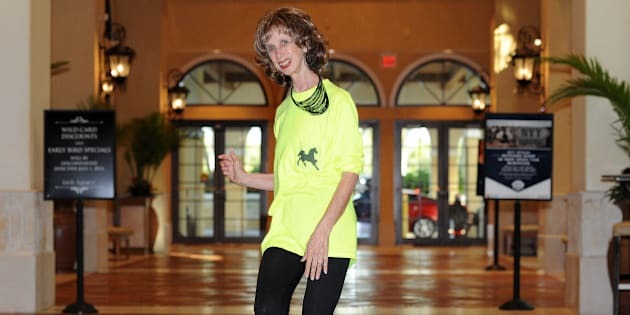 Prancercise is weird, for sure — the video of Joanna Rohrback demonstrating her self-created moves while wearing ankle weights and giving commands like "Let's stop talking and get walking!" went viral earlier this year and now has close to 9 million views on YouTube. But we admire the way Rohrback has embraced her internet-fueled fame, and she's probably laughing all the way to the bank. She got a deal endorsing pistachios and has a Prancercise book coming out in 2014. 2. Trapeze: We think there's probably a reason that Cirque de Soleil performers undergo so much training, and that reason is that this looks both very hard and totally terrifying. As Men's Fitness puts it, it "pits you against gravity." 3. Aerial Yoga: Isn't yoga supposed to be relaxing? How are you supposed to relax if you're worried about falling on your head? 4. Parkour: Obstacle courses sound like fun, but they also sound like a pain to set up. That's the appeal of parkour, where your surroundings are your course. Said to have originated in the suburbs of Paris, there are YouTube videos that make Parkour look both exciting and graceful — but we're guessing most people have an experience similar to that time they fell while trying to walk on the neighbourhood bike racks. 5. Drum Fitness: Sure, if you watch a really good drummer you can see how drumming could be a great workout. They get pretty sweaty. But let's face it, we're not all natural percussionists. We're thinking this is, in practice, more middle-aged-dad drum circle than Neil Peart. 6: Surfboard Yoga: Surfing looks hard enough, and now we're expected to execute a downward dog at the same time?! Impressive but unlikely. We think we'll just watch Point Break on VHS again instead. 7. Buti: And because yoga just can't be left alone, apparently, you can now sign up for Buti classes. In short, these are yoga classes combined with "tribal" dancing and plyometrics. You know, for when it's too cold for your yoga surfing lessons. 8. Aqua Zumba: Just as aerobics went from "Physical" hot to the territory of grandmothers in pools, so too goes Zumba. 9. Ki-Hara: Sure, you know stretching is important. You do a few bends before and after a run. But Ki-Hara is extreme stretching that engages the core and involves resistance. So if we do Ki-Hara, can we just skip the jog? 10. Tough Mudder: Tough Mudder might look crazy, and if you're not in decent shape it probably is. These outdoor obstacle courses bill themselves as "The Toughest Event on the Planet" and they might also be the dirtiest way to get a workout, if the photos on their site are any indication. But we'll admit that they look like a lot of fun, too.